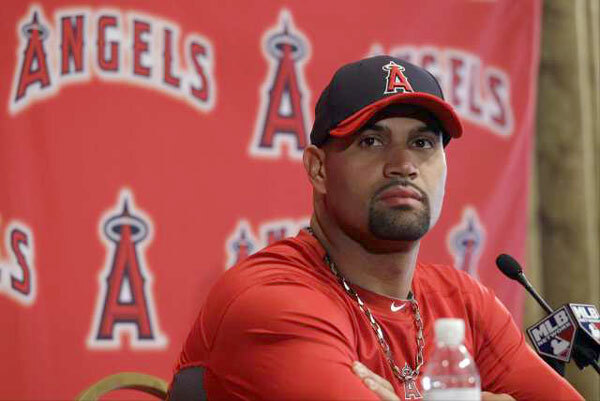 Albert Pujols certainly doesn’t look like the Albert of the past – but maybe it’s turning around for him. Fantasy buyers and sellers beware of the risk of picking up or trading the greatest hitter of the last decade. 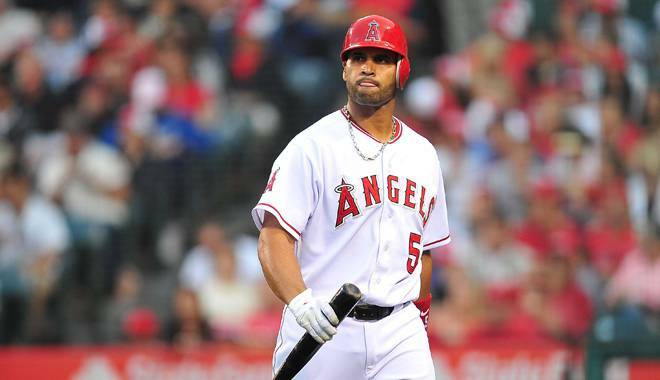 McGILLIGAN:What exactly is Albert Pujols worth today? It’s not a question many fantasy owners have asked over the years. Having been a perennial top three fantasy producer, Pujols was seen as off limits in trade talks and if he was in the discussion, the price was sky high. That was until he struggled to find his American League stroke early this season. What used to be a no-brainer – you can’t trade Pujols – is legitimately up for debate. The question becomes what is he worth and of course that depends on the team you’re dealing with. Does his terribly slow start mean you can offer less than premium players and expect the deal to happen? Or maybe he still commands a ridiculous, and therefore, prohibitive price. Trading in fantasy baseball is always a fun, but risky proposition. Trading one of the most consistent players in the history of fantasy baseball is even riskier. So which is the real Pujols? The guy who consistently puts up career averages of .326 with 42 homeruns and 125 RBI or the one hitting .213 with two homers and 17 RBI through 37 games in a new league. If I had to bet, I would bet on the 32-year-old slugger figuring it out sooner rather than later. Heading into play Thursday, he has a .310 average (9 for 29) and eight RBI over his past seven games. If anyone can turn it around, it’s Pujols. So now might be the time to roll the dice try and buy him at a discounted price. If it works out, you can call yourself a shrewd fantasy manager. If not, you can always blame Pujols for your miserable place in the standings. 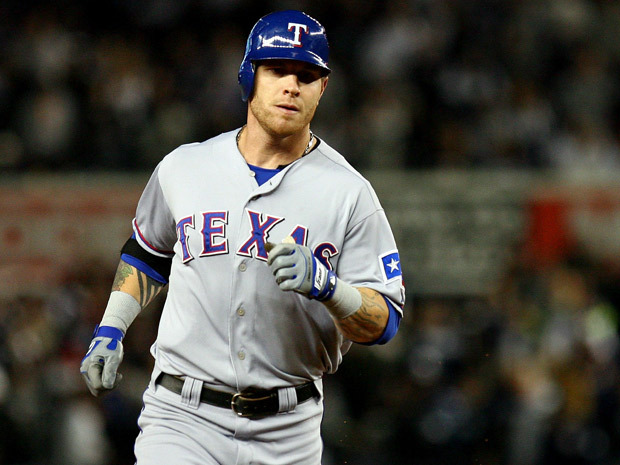 Josh Hamilton’s hot start: will Texas re-sign him? Josh Hamilton, if he stays healthy, will put up a mammoth year going into a contract off-season. Question is: will the Rangers spend money to keep him? LIVINGSTONE: We’re just about an eighth of the way through the season and the American League doesn’t look like the league preseason analysis expected it to be. Add Albert Pujols and Prince Fielder, New York picked up Michael Pineda to solidify their pitching staff, Pujols and co. looked like the perennial favourite to win the AL and the World Series, and the AL East had the look of a four-team race. Well, that, to this point, is all out the window. But what I really want to get at is Josh Hamilton. His story is well-known to everyone, how he rose from the darkness of drug and alcohol addiction to come back to professional baseball and become the elite hitter he was expected to be when drafted first overall in 1999 by the Tampa Bay Rays. He never played a game for them and it wasn’t until 2007 that he made his debut for the Reds. It’s been all history from there. When healthy, Hamilton has been a force at the plate in four seasons with the Rangers (Cincy traded him for Edison Voloquez after the 2007 season – wonder who won that deal). He’s helped lead the team to back-to-back World Series appearances, and if all continues the way the season has started for the Rangers, it could be a third appearance. Hamilton is in the last year of his contract and it’s unclear whether or not the Rangers will even attempt to sign him in the off-season. With big contracts just doled out to second baseman Ian Kinsler (five years, $75-million), catcher Mike Napoli (one year, $9.5 million, likely to turn into a multi-year if he continues to mash the ball like he has this season), Yu Darvish (six years, $60 milion, on top of the $50 million-plus they paid to negotiate with him), Nelson Cruz (2-years, $16 million) and Elvis Andrus (three years, $14.4 million) and third baseman Adrian Beltre (six years, $96 million) – you can obviously see it, is there even any money left to sign Hamilton? The team seemingly has spent a lot of cash to lock up everyone but Hamilton. Sure, his health is always a question and has only played 133 games maximum in the last three seasons (121 in 2011 and a mere 89 in 2009). The off-field problem involving drinking this past off-season seems to have scared the Rangers a bit in their willingness to sign up to a long-term deal. To be able to become the player he has become, Hamilton has to work three, maybe even four times as hard as everyone else. Staying sober is no easy task, especially coming off the life he lived for four or five years. So let’s look at why the Rangers would be insane to not re-sign this guy to a long-term deal. 2012 stats: 82 AB, 31 Hits, 3 doubles, 9 HRs, 22 RBI, .378 AVG, .418 OBP, .744 SLG and a sickly OPS of 1.161. This is only 20 games into the season. While he’s on-pace to hit 75 HR and 180 RBI, it’s not likely he will keep it up to that impossible expectation – but if he stays healthy he could put up 45/140/.350 – a definite AL MVP season. The Rangers would be crazy not to re-sign him if he puts up a big year like he is on pace to do. However, they might not be able to afford what he’ll be asking for. It’s going to be one of the more intriguing story lines as the season progresses. If Hamilton continues to lead the red hot Rangers atop the American League, and he stays healthy, will he stay in Arlington, or will he move on to another team? Nolan Ryan, don’t be crazy. Get that man a contract. Angels aren’t lookin’ so heavenly – are they a bust? Are the Angels already a bust? The 6-10 record isn't a sign of any sort of success considering they spent $300 million in the off-season to bring in a premium bat in Pujols, who hasn't hit a home run for his new club yet and has a mere four runs batted in. LIVINGSTONE: If the Los Angeles Angels of Anaheim don’t start getting it together, that $300-million off-season spending spree is going to look like one of the biggest busts in the history of the game. I know – we all know – Albert Pujols won’t under perform all season. In a couple of months we will be looking back at the start of the season, the first 16 games that have netted the Angels a 6-10 record good for last place in the division and seven games back of the juggernaut that is the Texas Rangers, and all will be forgotten. Question is, will it be forgotten? The Angels went out and landed the biggest free agent slugger in Pujols and the best pitching free agent in former Rangers starter C.J. Wilson with the hopes of putting the team, finally, into a good position to challenge for a World Series title after years of missing the mark. If you look at what the Angels have been doing in the first 16 games of the season, you have to wonder if the team is just too bloated with talent and can’t find a way for all that all-star power to gel together. Outside of Wilson and Jered Weaver, who both post sub-2.50 ERAs in just a handful of starts into the season (they’re a combined 5-1), the starting rotation has looked anything but lights out. Then there is the bullpen. They’ve been pegged with four losses and have only one save to show for the dismal start. Closer Jordan Walden, who was expected to be a dominate guy in the ninth, has an ERA of 4.15 and a WHIP of 1.62 – on the flip, he’s got a K-per-9 innings of 12.36, which is what should be expected of him. But one save, yeesh. He isn’t getting the opportunity to close games because the bullpen is blowing them before he even gets the chance to warm-up in the bullpen. Collectively, the pitching staff has an ERA of 4.47, a WHIP of 1.26 and has given up 18 home runs while putting together only eight quality starts. Things need to improve on this front or the bats waking up won’t matter. Yes, Pujols is putting up underwhelming numbers so far this year. No home runs, four RBI, an OPS of .654 and a batting average of .283. He’s a career .328 hitter. He’ll come around, he started slow last season and came on late to post a solid year for the eventual World Series champs St. Louis. However, when you’re RBI leader after 16 games is your catcher (Chris Iannetta has 8 ribbies) and your home run leader is Vernon ‘I am very much overpaid for what I do’ Wells, things aren’t looking good. Guys like Peter Bourjos, Alberto Callaspo are hitting in the .200 zone after 16 games, something that needs to improve vastly to bring some stability and fear back into the line-up. These guys were pegged to be integral parts of the batting order and are so far not proving that. I don’t think it will be too long before we see Mike Trout in the line-up (he’s hitting a near-.400 in Triple-A). No matter what – something needs to be done to get the team ignited. Are they a bust? For all the hype surrounding this team coming into the season – in some ways, yes they certainly are a bust. Besides Mark Trumbo, who is batting .350-ish, this club isn’t putting together any solid performances a the plate – on the mound, Weaver and Wilson look good, but it’s downhill after those two. It’s going to be interesting to see how the teams pulls itself together and gets onto a winning road, because the fans won’t patiently wait while this supposed-elite team continues to flounder.